Perhaps the biggest problem with casting a wide research net for a genealogy presentation is the vast array of neat stuff that ends up on the cutting room floor. But The Legal Genealogist can’t resist sharing this bit of neat stuff even if I can’t figure out how to neatly work it in to a keynote about Ohio law. What follows is a series of signatures — and talk about signing off with a flair! It was signed for the United States by William Hull, Governor of Michigan Territory and Indian Agent. And then it was signed by the representatives of the tribes. Take a look; there is no need for words. Just a note to say how much I enjoy your blog. Sometimes I get a tear in my eye, sometimes I laugh, and always am eager for the next post. Thank you, Judy! This is wonderful Judy. Are those thumb or finger prints taped next to their “signatures?” I too love stuff like this. I have a signatures tab on my blog because I enjoy having that piece of my ancestor on file. Great post. Thanks! It isn’t clear from the image whether it’s a fingerprint or not. They’re clearly intended as seals and some at the bottom may be wax seals. Judy, I’m thinking that these various Indians did not write their names. 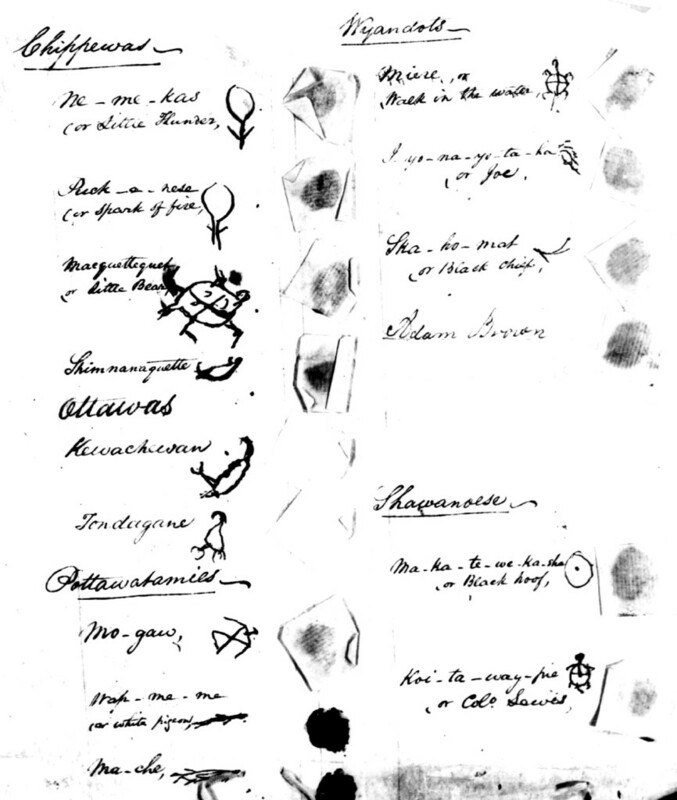 That the thumb prints are their signatures and the Indian agent is the one who wrote in English, the meaning of each thumb print. What a pleasant thing to see! Thank you for sharing this. I wish the white man had kept his promises. Marks used by our ancestors instead of a signature have always provided an interesting addition to talks. A good place to find them is on original ship records of the 18thC., or early probate and land records. Thanks Judy. This is a keeper. Lovely document, isn’t it, Stan? This is a whole different — and interesting — can of worms in its own right. Once upon a time, the Colony of Connecticut had claims on lands going westward all the way into what is now Ohio. These claims persisted even after independence and statehood. There were instances of towns in Pennsylvania that were considered as part of Connecticut [http://collection1.libraries.psu.edu/cdm/ref/collection/digitalbks4/id/1294]. Connecticut formally ceded its claims in 1800. The name of Case Western Reserve University reflects this former claim of Connecticut to the lands in northeastern Ohio. As an aside, there is some talk amongst some regarding the advantages and disadvantages of breaking up California into separate states (and, for that matter, the secession of New York City and/or Long Island from the State of New York). The issue of whether a state’s territory needs to be contiguous sometimes comes to the fore in such discourses. Connecticut provides precedent for a non-contiguous state, as does Massachusetts, which, prior to the Missouri Compromise of 1820, had a noncontiguous territory now known as the State of Maine. are to be found on Ellis Island and Liberty Island [New Jersey v. New York, 523 U.S. 767 (1998).]. Query: Where are the official records for the aforementioned political entities to be found? You know the answer to your question: it depends! Territorial records, state (and county) records, federal records all are kept and archived differently.